Science and Technology, University of Electronic Science and Technology, Chengdu, China. 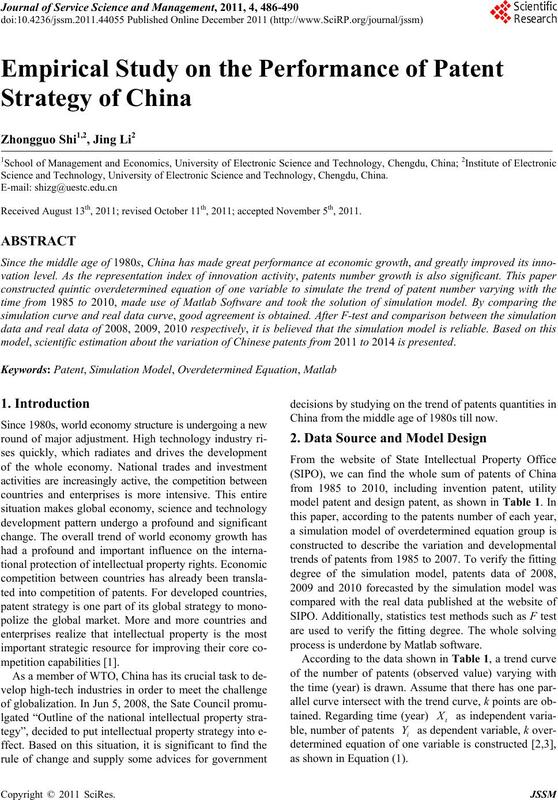 Received August 13th, 2011; revised October 11th, 2011; accepted November 5th, 2011.
model, scientific estimation about the variation of Chinese patents from 2011 to 2014 is presented. China from the middle age of 1980s till now. process is underdone by Matlab software. Table 1. Data of patens of China from 1985 to 2007.
a. Data Sou r ce: website of SIPO of China http://www.sipo.gov.cn/tjxx/. In which, , ,,…, are constants. 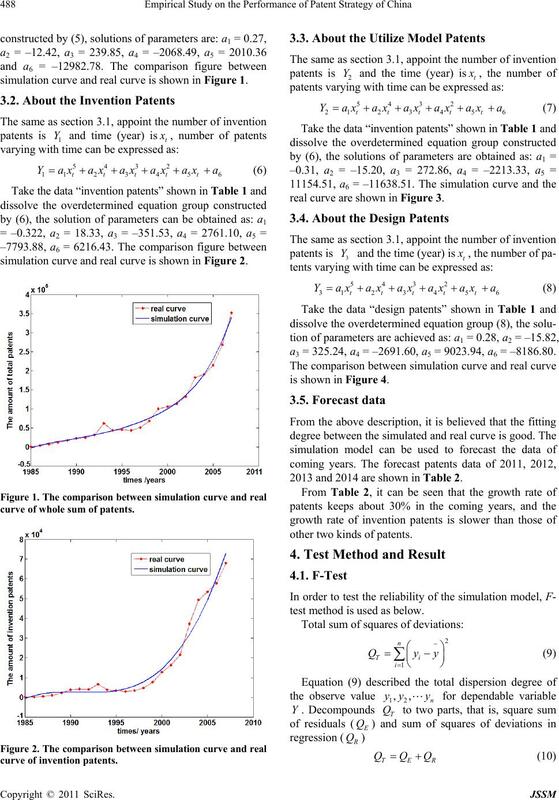 simulation curve and real curve is shown in Figure 1.
simulation curve and real curve is shown in Figure 2.
curve of whole sum of patents. real curve are shown in Figure 3.
a3 = 325.24, a4 = –2691.60 , a5 = 9023.94, a6 = –8186.80. 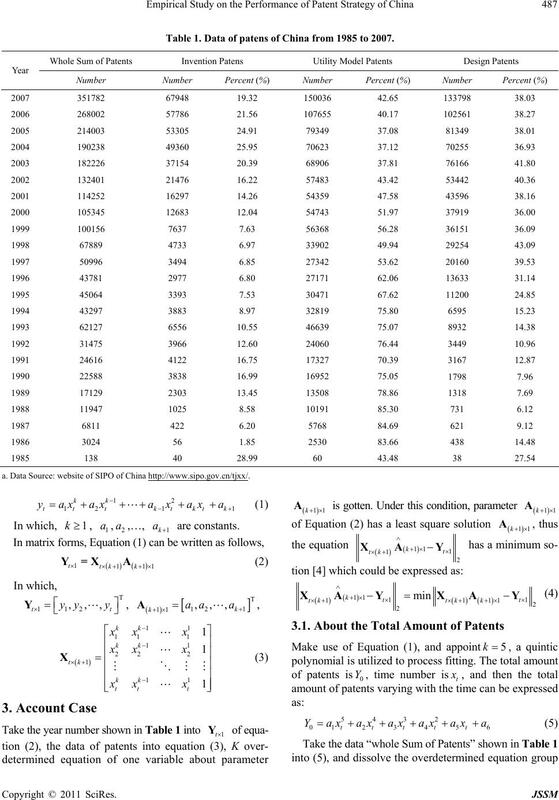 2013 and 2014 are shown in Table 2.
other two kinds of patents. test method is used as below. curve of utilize model patents. Table 2. The forecast data of the coming years. Table 3. 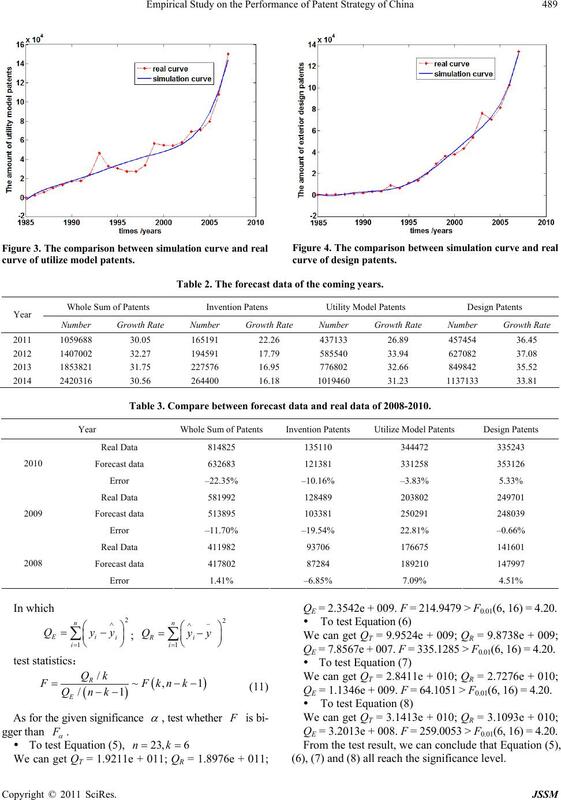 Compare between forecast data and real data of 2008-2010. QE = 2.3542e + 009. F = 214.9 479 > F0.01(6, 16) = 4.20. QE = 7.8567e + 007. F = 335.1285 > F0.01(6, 16) = 4.20. QE = 1.1346e + 009. F = 64. 1051 > F0.01(6, 16) = 4.20. QE = 3.2013e + 008. F = 25 9.0053 > F0.01(6, 16) = 4.20. (6), (7) and (8) all reach the significance level. SIPO. The results are shown in Table 3.
rors are tolerable, thus the simulation model is effective. significance level of the simulation model is also good. invention patent is slowest, and design patent is fastest. This phenomenon should be taken into consideration. great effect in the decades. 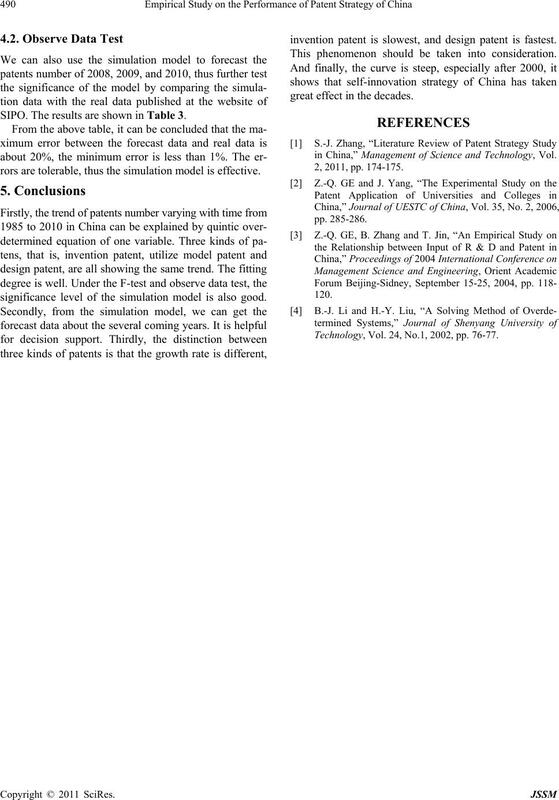 in China,” Management of Science and Technology, Vol. Technology, Vol. 24, No.1, 2002, pp. 76-77.